This is an update from an earlier post dated 27th May 2015. 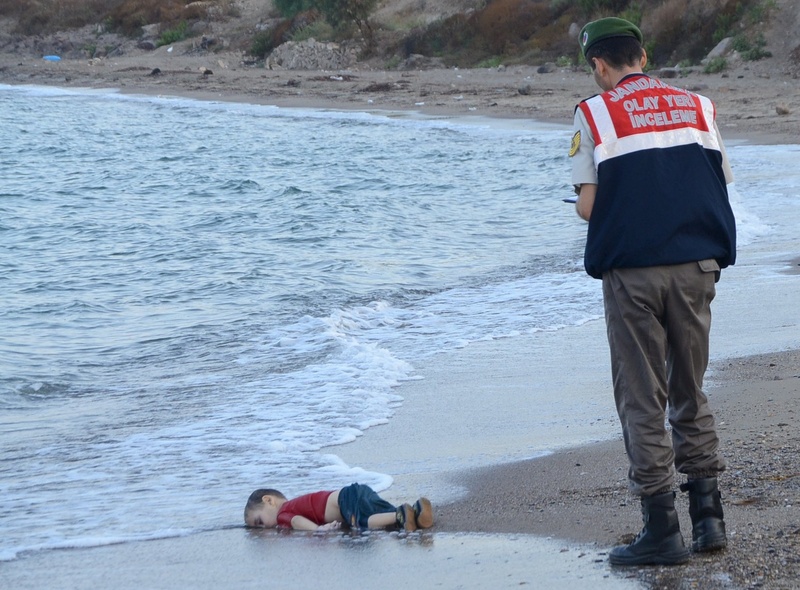 It references the image – now viral world-wide on social-media – of the body of a dead infant, Alan Kurdi, who, along with his mother and five year old brother, were drowned in their attempt to escape the conflict in Syria. The reason I’m staring at this photograph is that I’m waiting. Waiting for words. Imagery often has the power to move us, and in the above instance – for myself at least – I am reminded of that singularly iconic image of the horrors of modern warfare: the young Vietnamese girl, Phan Thị Kim Phúc, napalmed by South Vietnamese forces in 1972. AP photographer Nick Ut took that now infamous shot which won him a Pulitzer and changed both his and Kim Phúc’s lives. In a way it changed many of our lives, too. Certainly mine. It’s an image I will carry with me to my grave. I still cannot hear or read the word, ‘Vietnam‘ – even on the now ubiquitous holiday adverts for that very country – without my mind conjuring Nick’s image of Kim Phúc. Oddly, the resolution seems only to sharpen rather than diminish with age. I’d have dreaded being asked to pen a by-line for it – wouldn’t you? What words would you use? What words would suffice? What words could do justice to it? How long would you wait for them to arrive? I fear my inadequacy as a writer would be held bare for all to see. Perhaps there really are no words to describe such an image? Perhaps the image itself is all that is needed? I’d just about come to this very conclusion with regard to the UNRWA shot – possibly to excuse my own failings: The more I stared at it the more I knew I didn’t possess the words, the skill, or the imagination to write anything that could possibly accompany it. Doomed to simply stare daily at the incomprehensible savagery of it all. At that moment I knew that the image didn’t need a description, it merely required placing its instant – its moment – into its wider, greater context. Nick Ut had The New York Times to position his shot left and centre to the heart of the Vietnam conflict. 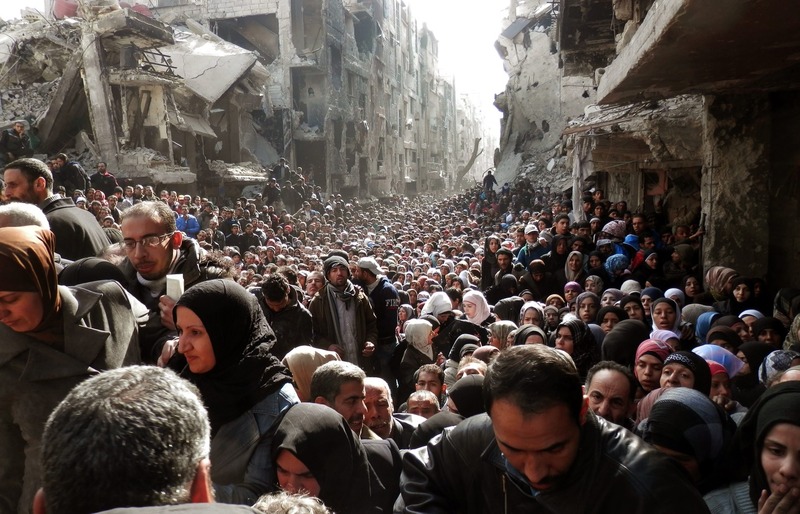 In our age of information overkill the UNRWA image seemed lost. Waiting for words that would never come. Not from me at least. “Tony Blair resigns as Middle East Envoy“. I’d written the above earlier this year after being shocked by the the UNRWA image. Last night I was aware that news editors world-wide were making a decision to use (or otherwise) an image (see left) that has gone viral on social-media over the last twelve hours or so. One small thing you can do is sign – and share – this petition. The link will also supply you with the email address of your local Member of Parliament (via your postcode). Over 100,00 people have signed this petition so far today. ‘What gives us the right to turn our gaze away when others have no choice but to see it’. Had a few emails from non-UK residents regarding the word ‘Swarming‘. “(Y)ou have got a swarm of people coming across the Mediterranean, seeking a better life, wanting to come to Britain because Britain has got jobs, it’s got a growing economy, it’s an incredible place to live”. The head of advocacy for The Refugee Council, Dr Lisa Doyle, condemned Cameron’s language. “It’s extremely disappointing to hear the prime minister using such irresponsible, dehumanising language to describe the desperate men, women and children fleeing for their lives across the Mediterranean Sea. Click on thumbnail or HERE for the SWARMING image – full screen. All images are used under ‘Fair Use’ rationale. No copyright infringement is intended.